Our TRIO Vinegar is crafted to mirror the classic Meritage wines where small lots of red wine varietals are blended to create wines with great structure and character. 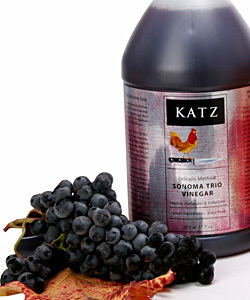 Trio vinegar is made this way by blending selected lots of Merlot, Zinfandel and Cabernet Sauvignon. The finished vinegar has a lovely garnet color with nuances in the flavor of sweet ripe berries and a firm structure of acidity, making it a "classic" red wine vinegar.